Our client Tile by Design is a well-known name in the North Shore community, enjoying 25 years of success in business and philanthropy. Tile by Design retains ALX as their go-to agency for all advertising and promotional materials, and website updates. ALX has helped Tile by Design grow their customer base over the years, and reach new markets through a variety of advertising services, including business cards, e-mail newsletters, promotional postcards, an online portfolio, and printed advertisements in community newspapers and special event programs. When Tile By Design needed a higher quality internet presence we selected Alx Creative Marketing Agency. Owner Alex Andrade guided us to the best possible website options available using hands-on personal service. Using Alx Creative Marketing Agency’s creativity and knowledge has resulted in a sophisticated and first-class site that reflects the upscale brand that Tile By Design has created. I’ve already recommended Alex to my friends and urge you to consider using Alx Visual Communications for your website development needs. The Tile by Design website stays relevant with new images constantly being added to the project galleries. The website includes a built-in blog and twitter feed, enabling Tile by Design to update their website’s content with minimal effort. Tile by Design enjoys the e-mail signup feature on the homepage, which automatically adds prospective customers to their newsletter list. The contact us page includes a useable Google Map, and an easy e-mail form, which makes getting in touch as simple as possible for busy clients. 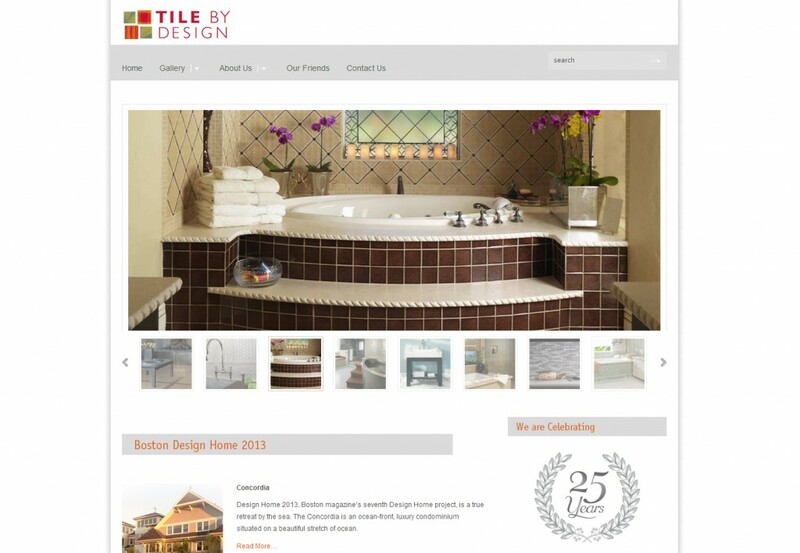 Tile by Design sends out a monthly newsletter, that is designed and developed by ALX. The newsletter reaches over 1000 of Tile by Design’s customers and prospects. Tile by Design has the ability to view a report for every newsletter, giving them insight to new leads when they see which customers opened and clicked. Like many businesses, custom branding is important to Tile by Design. The more visible their logo becomes, the more recognizable the brand. A business also will appear more professional when effort is put into presentation details. 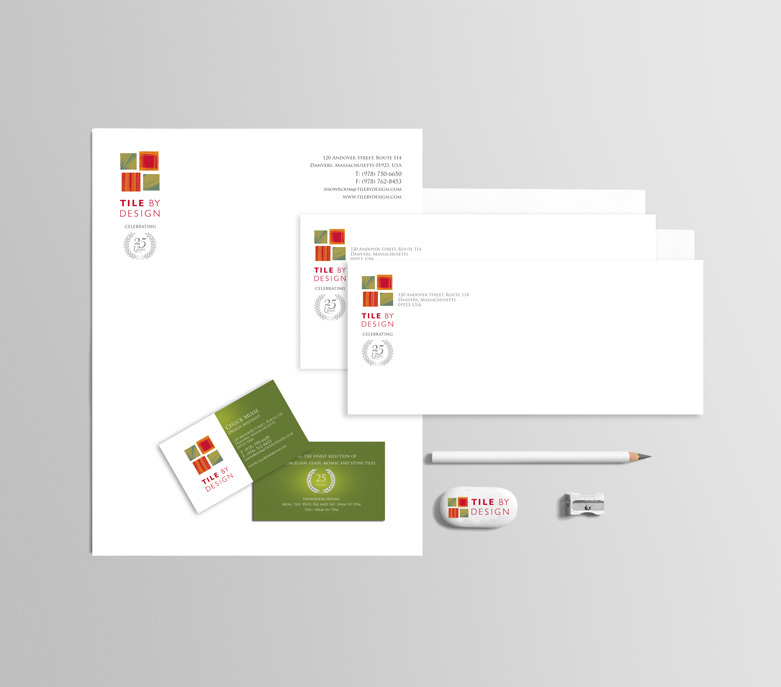 Tile by Design is proud to deliver all businesses correspondence with personalized letterheads and envelopes. For online communication, they have a personalized e-mail signature that is automatically attached to the footer of every e-mail. Tile by Design also received custom invoices, which lends a sense of authority and finality to the conclusion of each job. ALX helped Tile by Design reach thousands of prospective clients through our EDDM Postcard program. Homes all over the North Shore received an attractive, professionally printed postcard in the mail advertising a Tile by Design promotion, and inviting them to visit the storefront. Tile by Design often supports the community by purchasing ad space in local event programs and newspapers. To get the most out of their investment, Tile by Design turns to ALX to create an eye-catching presentation that will look great in a variety of sizes, in color or in grayscale. Adhesive windowclings were created for the storefront, to advertise Tile by Design’s services to the passing traffic on busy Route 114. The signage needed to be visible from a distance while still being attractive and professional, and harmonious with the existing design elements of the building. A unique part of Tile by Design’s custom advertising package was their need for personalized gift cards that could be purchased in their store and processed through their Point of Sale system. ALX designed attractive gift cards at specific price points to help encourage sales, and customer loyalty.